1. Mix idli batter, gram flour, red chilli powder, ginger, green chillies, curry leaves and coriander leaves. 2. Add onions and salt. 4. Make small balls of the batter. 5. Heat oil in a frying pan over medium flame. 6. Fry these balls till golden brown. 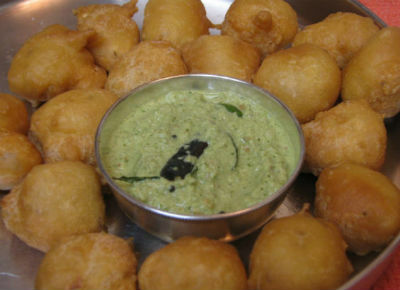 Feel free to comment or share your thoughts on this Instant Bonda Recipe from Awesome Cuisine.